Handmade by Helen J: Jump! The cue card for this week's challenge over at CASology is "Jump" and, unusually for me, I made a card just for the fun of it - normally I need to have a person in mind. I've had this stamp set in for quite a while but have only used one of them before so this seemed like a good time to rectify that. 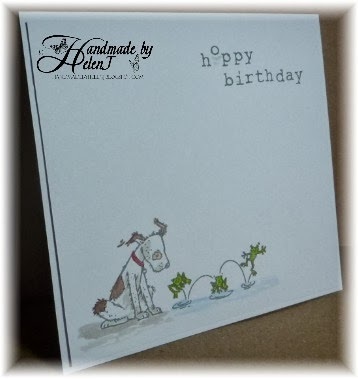 I didn't like the "Hoppy Birthday" stamp which came with the set so I used a Craftwork Cards alphabet set instead. I coloured the image using Letraset Aquamarkers. Oh wow, Helen! What a great card! It really made me smile! Simply delightful! This is a seriously cute card! So glad you joined us at CASology this week! Helen, this is quite cute! 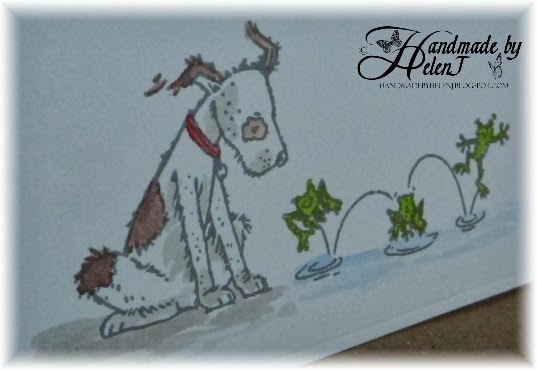 I love how that sweet dog is just watching those jumping frogs so pensively! Great coloring, fun sentiment! So glad you played along at CASology this week! Cute cute cute I agree!!!! Some sweet jumpy action, LOVE this!! Thanks for joining us at CASology this week!!! And this is . . .